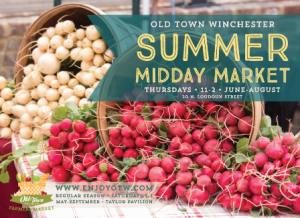 On Thursday, June 7 the Old Town Winchester Farmers Market will open for the first time on Thursdays as well as Saturdays. The Summer Midday Market will be open Thursdays from 11 a.m. – 2 p.m. June, July and August in front of the Old Courthouse on Loudoun Street. It will offer area employees, residents and visitors the opportunity to shop for delicious local produce, eggs, meats and much more. Five of the farms participating in the Thursday market also participate in the Saturday market which is held at the Taylor Pavilion. Farms will offer a wide variety of items for sale including in-season vegetables, soap, artisan breads, cookies, cheese, grass fed beef, gluten free bread, mushrooms, cured meats, jam, eggs, honey and many other items (produce and items for sale vary each week with what is in season). All items were grown or produced within a 60-mile radius of Winchester. “This market makes delicious local food accessible to downtown employees and residents who are already downtown and can shop on their lunch hour,” notes Jennifer Bell, Downtown Manager and market organizer. This year opening day customers will receive an Old Town Farmers Market transparent sticker (while supplies last). For the second market, on June 14, shoppers will get a free OTW Farmers Market cooler tote with their first purchase at the market. Cooler totes will be available June 14 for the first 200 shoppers. Bethlehem Farm (Winchester, VA) – Pasture poultry including chicken and turkey, grass fed beef, pastured pork products, eggs, raw milk cheese, produce, honey, organic fresh milled breads, cookies, sweet breads, brick oven pizza, prepared chicken stock and soups, prepared foods like quiche and pot pies, handcrafted jewelry and art, prepared sandwiches. Boward Family Farm (Augusta, WV) – Produce, eggs, jams/jellies, pickled vegetables, baked goods, cut flowers, essential oil based items such as insect repellent and air refresher, dried herbs, finishing salts, herbal tea, lotion bars, lip balm, sugar scrubs, salt scrubs, herbal salves, all natural cream and spray deodorants, tooth powder. Hedgebrook Farm (Winchester, VA) – Raw milk cheese including Cheddar, Tomme, Gouda, Feta, Blue Cheese, and Camembert. Shady Knoll Mushroom Farm (Winchester, VA) – Gourmet edible mushrooms, homemade specialty soaps. Sycamore Creek Farm (Stephenson, VA) – Produce, eggs, potted plants (annuals, perennials, herbs), fresh cut herbs, fresh cut flower bouquets, arrangements, wreaths, poplar baskets, birdhouse gourds, crochet shawls, crochet tablecloths, hand drawn cards, sausage by the pound. Valley Stream Marketplace (Winchester, VA) – Fresh cut flowers, dried flowers/potpourri, potted seedling plants, felt covered goat’s milk soaps, handmade novelty soaps, loaf breads and muffins made from farm produce. Valley Roots Farm (Middletown, VA) – Produce including greens (arugula, lettuce, spinach, baby kale, mustard greens), peppers, tomatoes, okra, eggs. The market still has spots available for additional vendors. Interested vendors should contact Market Coordinator Sarah Acuff Chapman at (540)535-3660 or OTW@WinchesterVA.gov.